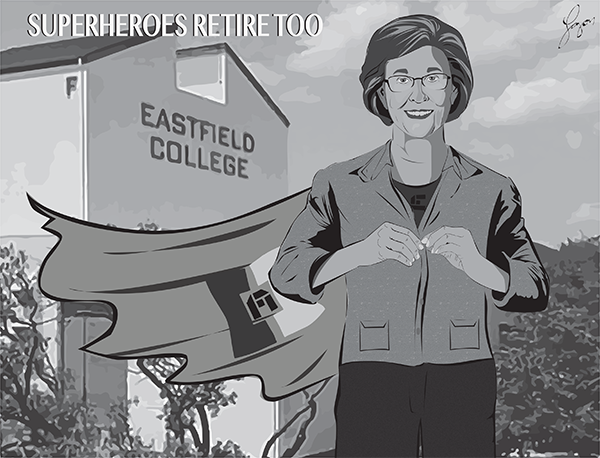 Eastfield’s knight in shining pantsuit, Jean Conway, is retiring after serving as president since June 2011. Lovingly referred to as the “queen bee” by Eastfield employees, Conway has worked tirelessly for the good of the school. While she is Eastfield’s VIBee and an incredibly busy person, it’s always a pleasure to see her visiting students and employees during her campus walks. When she first started as president, the Southern Association of Colleges and Schools put Eastfield on warning status for not having enough full-time faculty. More than seven years later, Eastfield enrollment numbers are approaching 16,000 and the college is expecting to hear (mostly) positive feedback from the SACS accreditation committee. Conway has worked to make Eastfield a more sustainable campus, promoting better recycling and after The Et Cetera reported malpractice in recycling programs, working to immediately fix any problems with sustainability efforts. The Et Cetera also holds Conway dear to our hearts. We haven’t faced censorship by the school, even when we’ve published less than flattering pieces about campus issues and policies. To the contrary, our reporters have received phone calls from Conway letting us know what would change or asking for our suggestions. As a parting gift to The Et Cetera, she’s finally knocking down “the wall” and expanding our office space. You didn’t think we’d forget about that, did you Conway? So, before you leave us and enjoy cruising the Bahamas, sipping wine whilst reading a novel or whatever retired people do (as students we can’t begin to fathom what it’s like to have free time), all of us at The Et Cetera would like to say thank you, Dr. Conway. Thank you for everything you’ve done for Eastfield student journalists. Now we’ll find out what President Eddie Tealer will do for Eastfield and, to our concern, student media. Tealer started his career working for a corporate bank but quickly discovered that making boatloads of money and the perks of corporate America weren’t fulfilling. When starting out at the Dallas County Community College District, he went from a DCCCD senior financial analyst to vice president of business services at North Lake. From everything we’ve seen and heard, we expect Tealer to take time to interact with students and listen to feedback from the college community in making decisions. With the executive team he has and the extra guidance from Conway in his early days, we believe we will see Eastfield continue to improve. Tealer has already been friendly with Eastfield’s student media, taking time on the day of his nomination to give us a call and make a comment. We look forward to continuing a good relationship and hope that any future Et Cetera coverage will be met with the same regard. Tealer, we at The Et Cetera believe you’ll defend student media just as well as Conway has, but know that you’ll have some enormous shoes to fill in that aspect. We hope you’ll give us the support student media needs. We can say now that we, and any staff that comes after us, will do our best to provide fair, balanced coverage of news important to the college community.